Jill Weiss Simins is a historian at the Indiana Historical Bureau (IHB) who works on Hoosier State Chronicles (HSC), a free database of digitized Indiana newspapers. 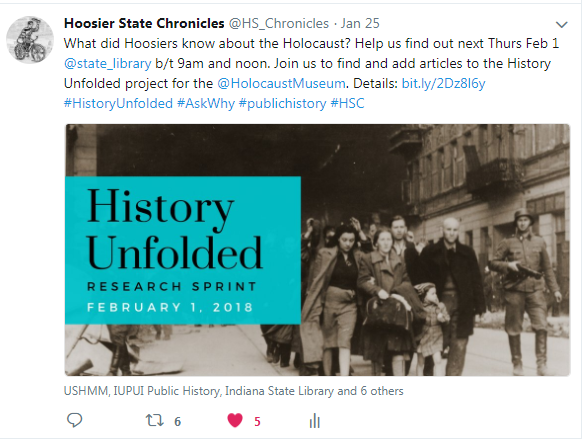 Over the past year and a half, she has been contributing to the History Unfolded project and writing about what Hoosiers knew about the events leading up to the Holocaust for the Hoosier State Chronicles Blog. Jenna Auber is an intern at IHB working towards her master’s in public history at Indiana University-Purdue University at Indianapolis (IUPUI). She has contributed over 100 articles to the History Unfolded database. 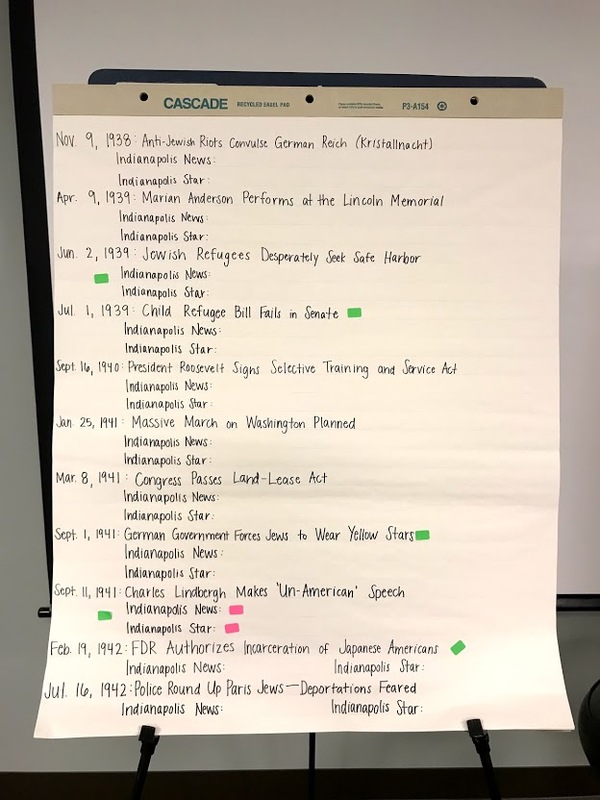 In this guest blog post, Jill and Jenna share how they became involved with a special research challenge at the Indiana State Library (ISL). The task? Help the United States Holocaust Memorial Museum (USHMM) meet its “state-by-state” goal of gathering at least one article submission or no-coverage finding on each of 33 events from the two highest-circulating newspapers in Indiana during World War II, The Indianapolis News and The Indianapolis Star. Jill and Jenna jumped at the opportunity to assist. In particular, they wanted to help determine what most Hoosiers knew about the events leading up to the Holocaust. What they accomplished exceeded the History Unfolded team’s most optimistic expectations. Jill Weiss Simins (left) and Jenna Auber (right) prepare for a public research sprint at the Indiana State Library. After a transformative visit to USHMM in 2016, I felt compelled to further the museum’s mission in some modest way. As a historian at IHB, a small state agency (with an equally small budget), could I help make sure that the lessons and warnings of the Holocaust are not forgotten? Could IHB make Holocaust history more accessible as our community deals with current issues of antisemitism, nationalism, and the plight of refugees? And could we make this history relevant to Hoosiers, who sometimes feel removed from national conversations? The History Unfolded project allows anyone facing these challenges to make a small but meaningful difference. I first looked through newspapers freely accessible through Hoosier State Chronicles (managed by both IHB and the ISL). HSC contains small town newspapers, papers from large industrial areas, a major African American newspaper, and the mighty (Indianapolis) Jewish Post. I was moved by the content and breadth of the articles and thankful to have such diverse perspectives on which to draw. 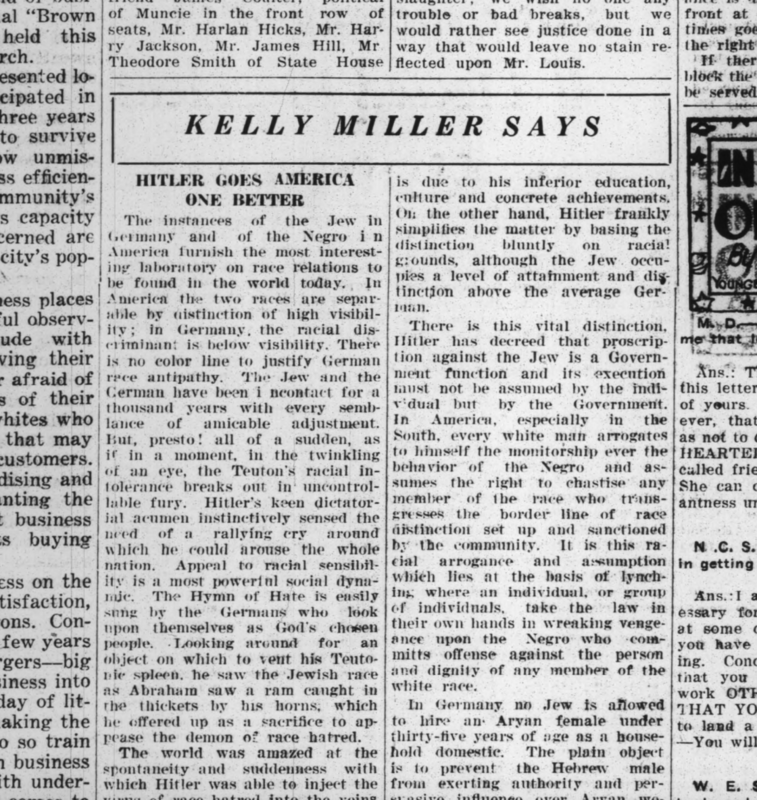 While, like others working on the project, I found that major events were sometimes glossed over, misinterpreted, or confined to small articles on back pages, Hoosiers did have ample information about the horrors facing the Jews of Europe as early as the mid-1930s. And they had opinions. Columnists argued that the U.S. should stay out of Europe’s problems. African American writers argued that there was enough prejudice and violence to combat at home. Others passionately pleaded for the admittance of more refugees or the creation of a Jewish state in Palestine. Submitting articles to History Unfolded was instantly rewarding, as I felt I was helping with an essential project with national significance. However, I really wanted to share the articles that I was finding, put them into conversation with one another, and place them into historical context. 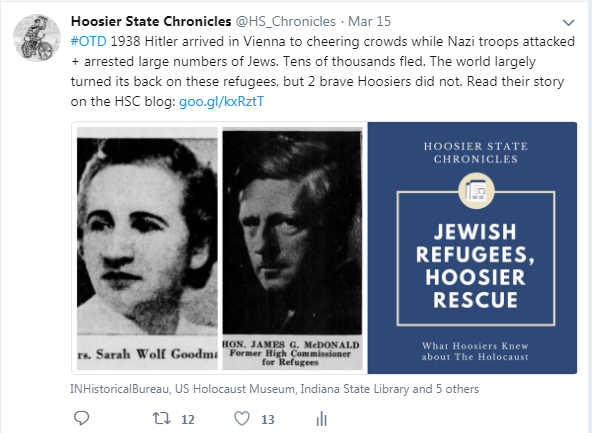 I started writing in-depth posts for the Hoosier State Chronicles Blog and sharing articles on Twitter @HS_Chronicles. I often posted, “What did Hoosiers Know about the Holocaust?” and included a snippet of an article from a local paper. These posts were shared widely, and in general, people were surprised that so much information was available while so little was done. I have also made it a priority in recent posts to include the stories Hoosiers like James G. McDonald, who worked tirelessly to help the Jewish people of Europe and find homes for refugees. This exchange was making a difference, but I still hoped to get more people involved. I began working with History Unfolded last year at Hanover College as part of an immigration history course. I had always found the WWII-era interesting, but had not given much thought about what Americans knew about the Holocaust as it happened. The project allowed me to combine my love for research with a goal to find out what Americans knew and when they knew it. So, I was eager to join Jill in contributing to this project in collaboration with HSC. While Jill focused on sharing our findings on the HSC blog and social media, I did most of the finding and submitting of articles to History Unfolded. I was excited to be contributing so many articles to the project, and to share them on the HSC Twitter. I was surprised to find so many opinionated pieces from Hoosiers at the time, sharing what they thought about the events in Europe. These opinion pieces became the main item I searched for, because they allow us to understand not only what Americans knew about the Holocaust, but also their reactions and beliefs. It also allows us as researchers and citizens today to relate to past Hoosiers as they experienced major changes in their world, just like we are currently. 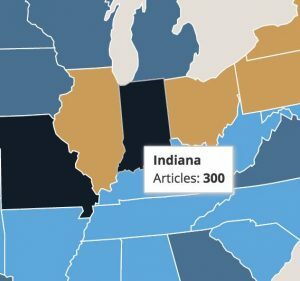 Thanks in a large part to Jenna and Jill’s work, Indiana hit a milestone of 300 published articles in January 2018. Soon after Jenna joined IHB, Eric Schmalz, the History Unfolded project manager, reached out to us about hosting a research sprint to contribute to the project’s “state-by-state” initiative of collecting articles from the two newspapers in each state with the largest wartime circulation. We were thrilled to have the opportunity to introduce more people to the project, both passionate historians and curious citizen historians. We wanted the event to be open to the public, like the History Unfolded project itself, but we also wanted to reach out directly to the university closest to us, IUPUI. Several professors were interested in the project and offered extra credit to their students. We also used social media to make clear to the general history-interested public that no experience was necessary. Our main organizational concern was designing a system to make sure attendees covered all of the events and did not duplicate research. We created large charts with all of the events listed, and under each event, the name of the two major newspapers to search. Researchers put a green sticker next to the event they chose to claim as their own. Then they searched for articles, placing a pink sticker next to the newspaper name when they found and submitted an article. Charts such as this one help keep sprints organized and engaging. We were fortunate that our coworkers volunteered to help with the event. In addition to Jenna and myself, we had another historian at a table to greet attendees and another to help walk them through the History Unfolded website if needed. We also prepared a packet of directions for those who preferred to work solo. While not as many people came as we had hoped, those that did were so much more engaged that we had anticipated. We thought that people would stay for about an hour, but they stayed for an average of three or four hours. Our attendees were mostly graduate students in the public history program. We also had one high school teacher said that she would include the project in her class. And we had one IUPUI professor who saw so much value in the project, both in its mission and ability to teach with primary sources, that he is going to work with us on another event in the fall. We were especially heartened to be a part of the insightful conversations that broke out organically over the course of the sprint. The attendees began sharing their findings with each other and took the conversation to Twitter. The research sprint attendees submitted sixty-six articles that day, which were all approved. More importantly, most expressed interest in continuing their research after the event ended. A tweet conversation from the February 1, 2018 research sprint. After the research sprint, there were about nine events that still needed coverage. I was able to finish up within a couple days, pushing Indiana over 500 articles in the database. After submitting so many articles myself, I developed a process to search for relevant articles in Indiana papers using the very helpful search terms and dates provided on History Unfolded’s website. Refining my search to one set of dates and searching the terms both one at a time and combined together was extremely helpful in finding not only Associated Press articles, but also letters to the editor and opinion pieces that would otherwise be hard to find. Being patient and using a smaller range of dates to search is much easier when researching events, especially major events that received a lot of coverage. We are going to continue submitting to History Unfolded for as long as they will let us! And we will continue to share and analyze these articles on the Hoosier State Chronicles blog and Twitter. We hope you will visit us and join the discussion! 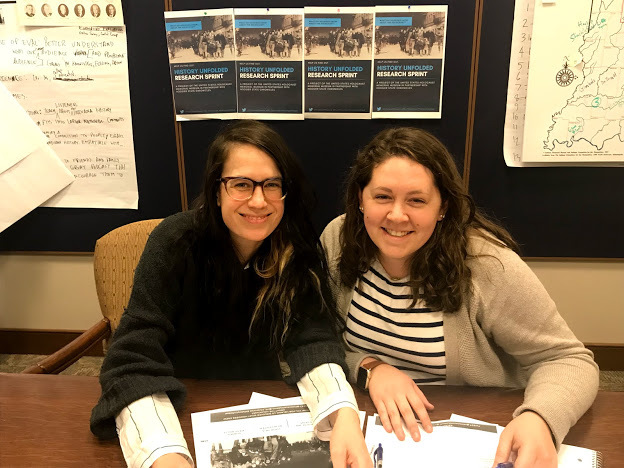 The team at History Unfolded central extends a big thank you to the work of Jill Weiss Simins, Jenna Auber and other staff at the Indiana Historical Bureau. Here are links to the submissions from The Indianapolis News and The Indianapolis Star.